Eliodoro Vallecillo appeared on Show 150, recorded in January 2007, at age 16. Eliodoro Valleallo (French horn), 16, originally from Mexico, lives in Santa Cruz, CA and attends Georgiana Bruce Kirby Preparatory School. In addition to playing the French horn, she sings soprano and plays the piano and accordion. 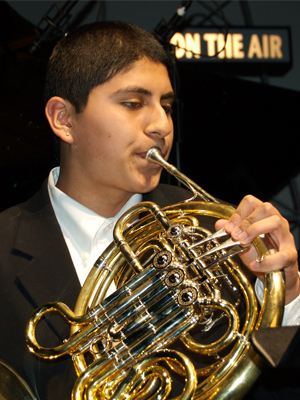 Eliodoro currently plays horn in the San Francisco Youth Symphony and one day hopes to study at a conservatory and then join a symphony. Eliodoro is a Jack Kent Cooke Young Artist.